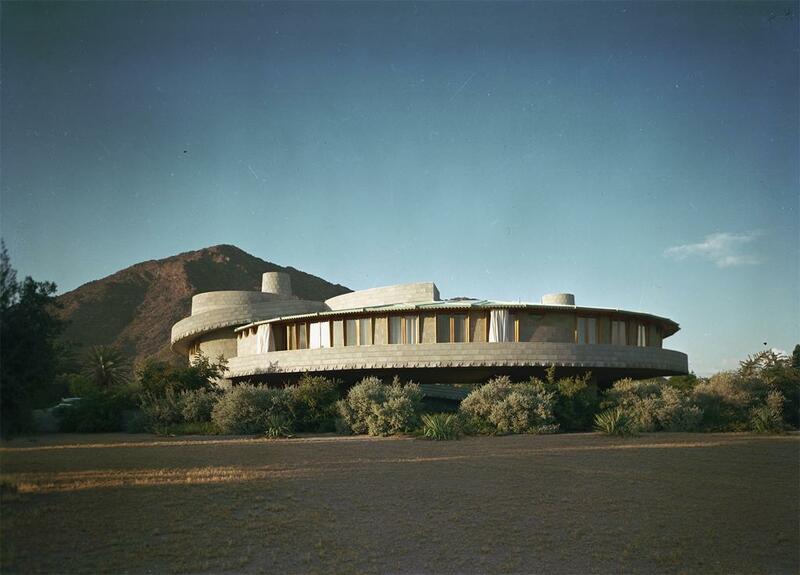 THE WEEKLY WRIGHT-UP: LI XIAODONG VISITS THE MARTIN HOUSE; DAVID WRIGHT HOUSE SAVED! LI XIAODONG VISITS THE MARTIN HOUSE; DAVID WRIGHT HOUSE SAVED! According to Brian Carter, professor and former Dean of UB’s School of Architecture and Planning, Li Xiaodong, a rising star in the world of Chinese architecture, was so determined to visit Buffalo during his brief stay in the U.S. that in the face of hurricane Sandy, the storm that has devastated the east coast, he and Leslie, his wife, rented a car and drove to Buffalo in heavy rain where they were housed in the Martin House gardener’s cottage and dined in the George Barton House. It all made perfect sense when, in his presentation at UB he outlined the recent history of Chinese architecture and his emerging place within it. 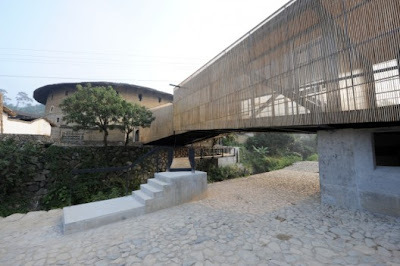 By studying first in China, then in Holland, then working in Shanghai where he watched the feverish race to import American and European architects to build entire high-rise cities virtually overnight, Li sensed the loss of significant chunks of Chinese culture and a need for an authentic, regionally-based, sustainable architecture. 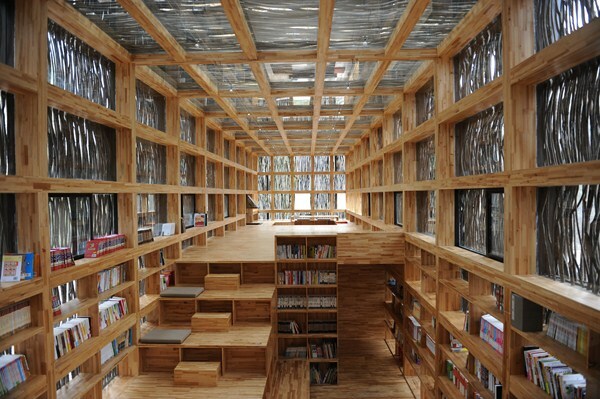 His Liyuan Library, glass-enclosed and sun-shaded by thousands of salvaged sticks, is designed to draw cool air off a nearby pool in the summer. The interior tiered hall reveals its timber structure with a hint, perhaps, of Wright’s Larkin Building. Li’s School Bridge for the village of Pinghe (2008-9) won an Aga Kahn Award for its multiple functions as school, stage, playground, and bridge all of which connect two ancient round castles to form a new civic core for the village. Given the obvious affinity to Wright’s concern for the nature of materials, we think Li Xiaodong and Leslie slept happily in the gardener’s cottage. 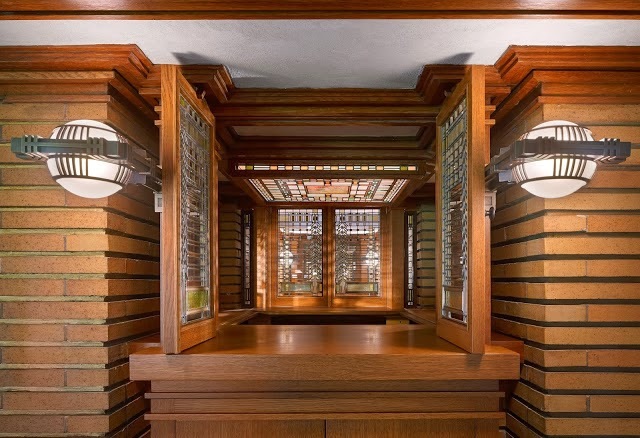 Thanks to the heroic efforts of a task force of board members of the Frank Lloyd Wright Building Conservancy, the Mayor and other enlightened persons in Phoenix, and some very generous benefactors, it appears that the David and Gladys Wright House in Phoenix will be preserved. 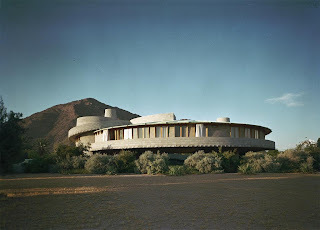 For a Phoenix-based account see http://www.azcentral.com/community/phoenix/articles/20121031frank-lloyd-wrightdesigned-home-sold.html. Whew!